"Vessel 42, Burial 8, 2003.08.1287" by Timothy K. Perttula and Robert Z. Selden Jr.
DECORATION (INCLUDING MOTIF AND ELEMENTS WHEN APPARENT): Horizontal and diagonal brushing on the rim, and vertical brushing on the vessel body. The brushing extends to just above the base. 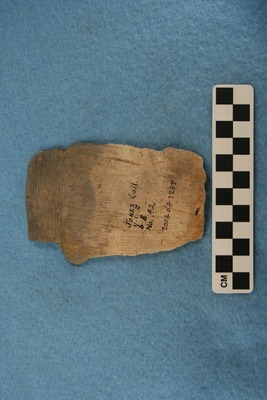 Bullard Brushed jar rim sherd, Vessel 42, Burial 8.